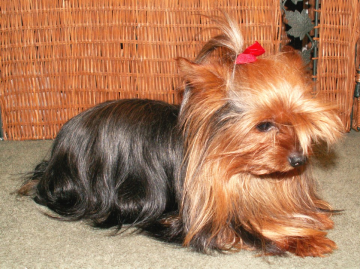 Check out our available yorkie puppies. Yes, we are a breeder of AKC registered Brussels Griffons. Check out our available Griff puppies. Could you give "Jennings" a new home? "Darby the Griff's owner says" She doesn't mind having clothes on at all! She stayed in that hot dog costume for about 3 hours while the whole family carved pumpkins in our shop last weekend. Here she is today in her jacket...it's chilly here today! She went to the vet this week for her last booster and rabies shots. She weighs 3 lbs 3 oz. She is a hoot...such a big personality in a small package! She also loves to snuggle"
"I just wanted to send you some pictures of JJ, the Brussels I purchased from you. He is such a wonderful little guy! His last vet appt. 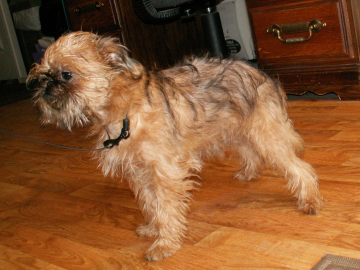 JJ weighed 3lbs 4 oz, He's so mellow and easy, with a really loving temperament. He potty trained so easy, and was totally potty trained day 2 of coming home. I couldn't of asked for a better baby. My mom and sister just adore him, everyone thinks he is the friendliest puppy they've ever met. Respectfully, Melissa"
"Titus is now close to 5 mo. old, and doing great. He just graduated from puppy I class, and will start puppy 2 next week. He does his commands with precision, but totally ignores me when outside on a walk, being totally distracted by the smallest of things. I'm keeping up with all his shots, etc. We love him. He sleeps with us, mostly against out heads. He has a great life.I'll keep in touch. Thanks, Bob." If you are looking for a small dog, you might be interested in a Yorkie or a Griff. Yorkies are Bold, Confident, Courageous, Independent, Intelligent, and affection, typically 4-7 lbs. .
Griffs are Alert, Companionable, Inquisitive, Self-important, Sensitive, Watchful, typically 7-12 lbs.